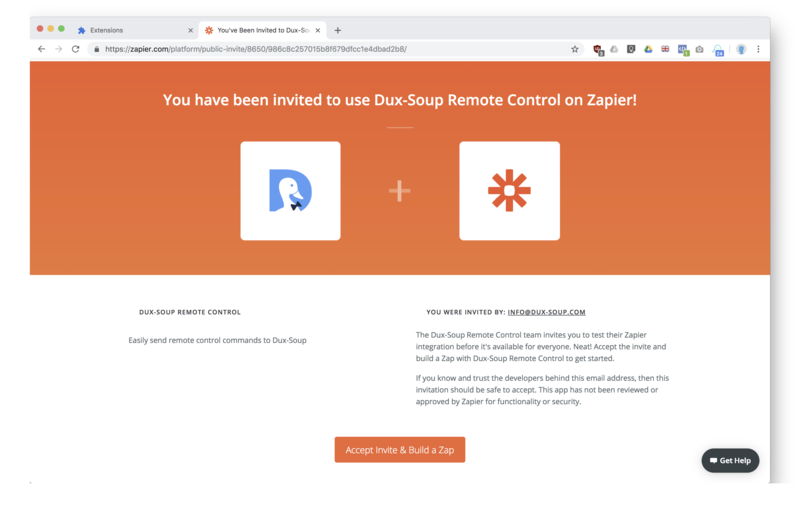 To make it easier for our non-technical users to use the Dux-Soup Remote Control function we have created a Zapier action for it. You can access this action via this URL https://zapier.com/platform/public-invite/8650/986c8c257015b8f679dfcc1e4dbad2b8/ . Once you have accessed this URL and clicked on “Accept Invite & Build a Zap” , the action will be available for your Zaps. As this concerns an ‘action’ you will need to define a trigger first in your Zap before it can be added. 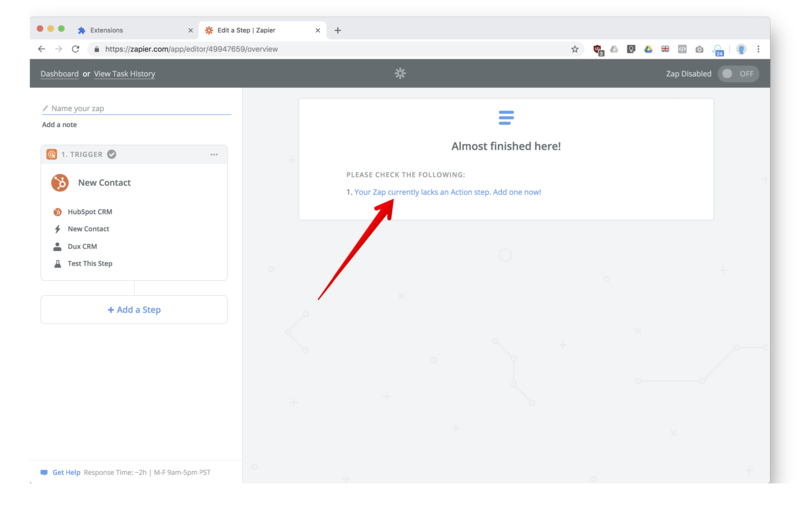 In this example we’re going to create a Zap to send a LinkedIn connection request when a new customer is created in Hubspot CRM. 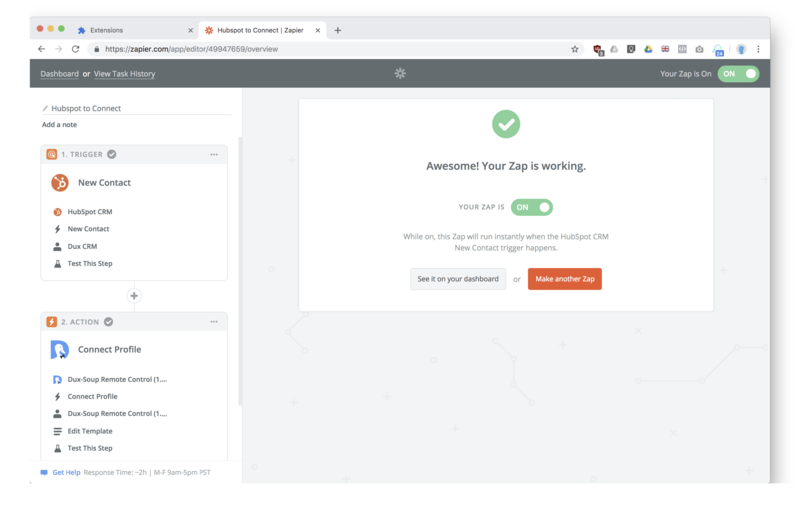 So let’s get started and click “Make a Zap” in the Zapier Dashboard. 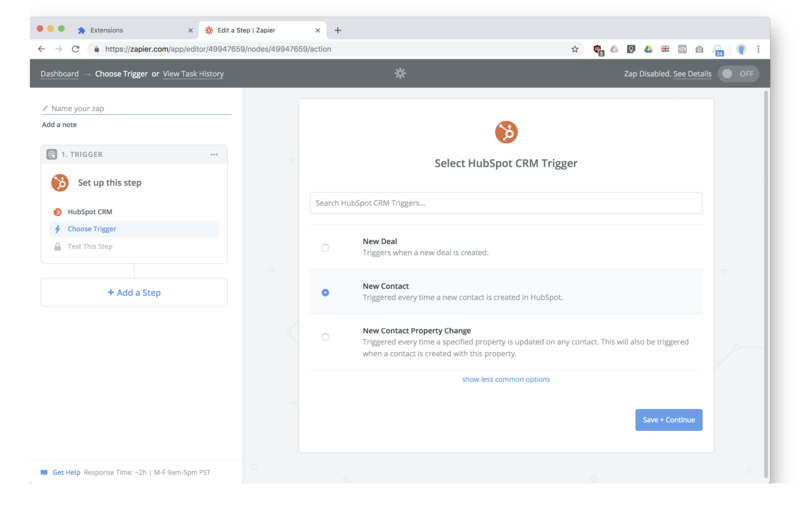 Hubspot CRM has a number of triggers available in Zapier. In this example we’ll use the "New Contact" trigger to start the Zap. 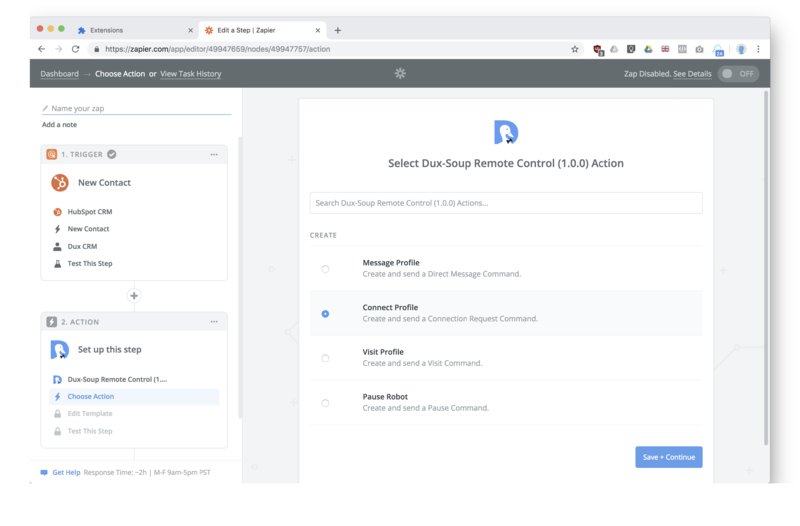 After selecting the trigger and connecting our Hubspot CRM account it is time add the action. 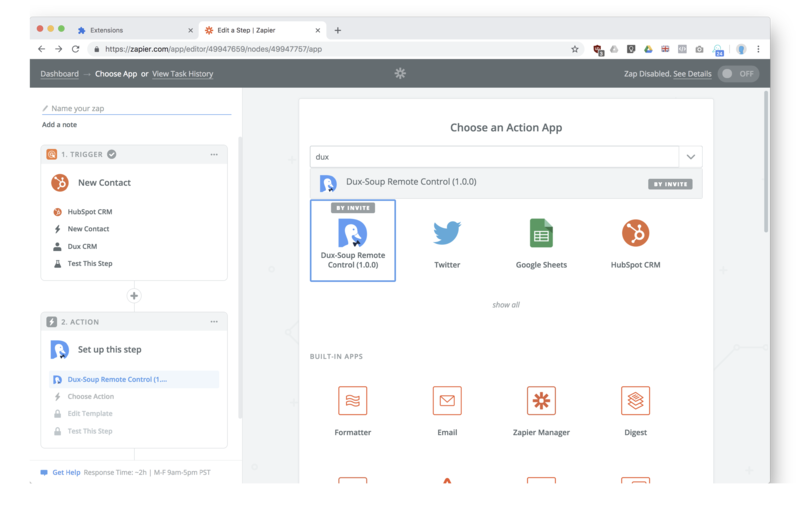 This starts the action wizard in Zapier, which first requires us to find and select the type of action to add. 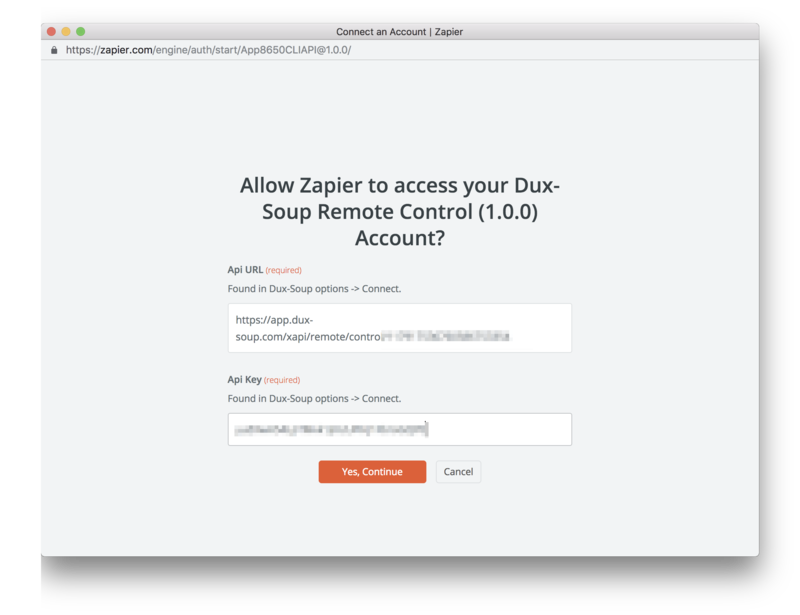 Here we simply type 'dux' to find the Dux-Soup action and select it to add it to our zap. 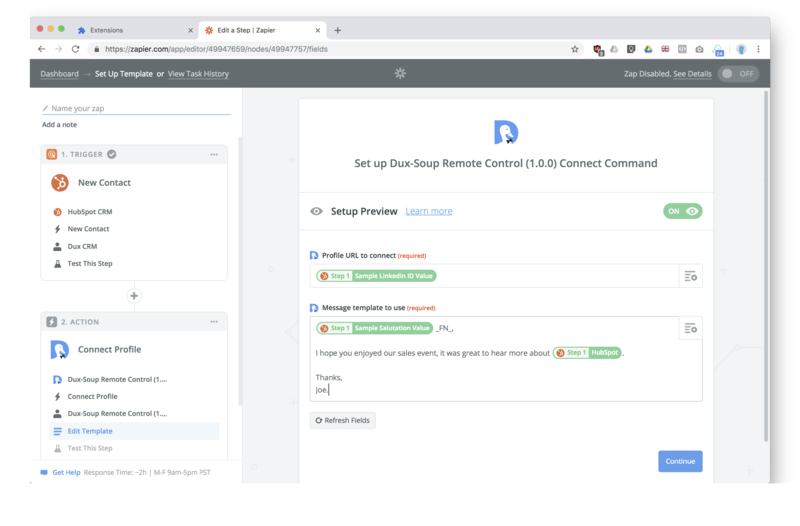 We select Connect and are then prompted to connect to our Dux-Soup Remote. For this we need the details of the target Dux-Soup we want to control. The details can be found in the Dux-Soup options panel, on the Connect tab. Just copy and paste them and select 'Yes, continue'. The message template of the connection request. Note that we can use multiple fields to build the template. That's all. Now we just need to enable the Zap and from now on, whenever a new client is created in Hubspot CRM, we automatically send a connection request in LinkedIn.